A sweet gift to remember a special recital or to give as a present to your favorite dance teacher. 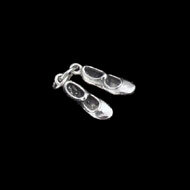 This is fashioned in sterling silver featuring two tap shoes. A sterling ring to attach the shoes together is included. Each shoe is 3/16 inch wide by 5/16 inches long.